It’s the Easter Jeep Safari, the time of year when Jeep teases the world with unattainable concept vehicles that us ordinary humans will never be able to attain. But this year is different. Jeep did what we all would do and bought a ‘90s ZJ Grand Cherokee off of Craigslist. The ZJ debuted back in ‘92, so this marks the 25th anniversary of the car. 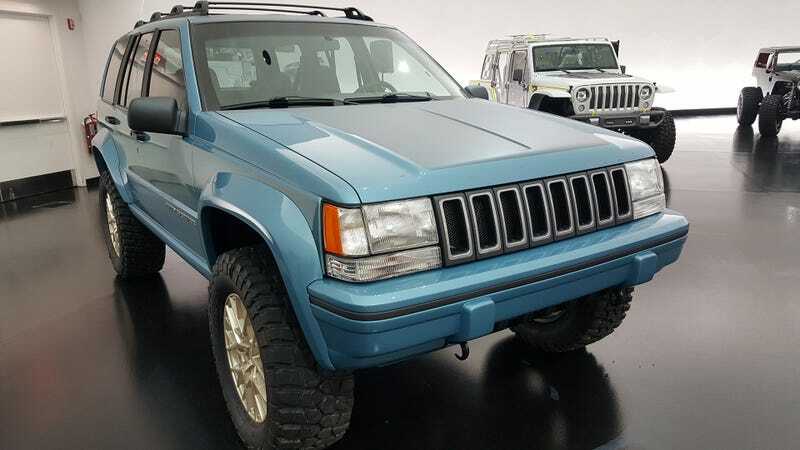 This one in particular is a 1993 Grand Cherokee that Jeep itself bought on Craigslist. Lengthened wheelbase, standard 318 motor, standard four speed trans. Beefy axles. To be more precise, Jeep gave this thing a 2" lift, and the longer wheelbase comes from moving the front axle 2" forward, the rear three inches back. Longer control arms get the job done, and shaving the body makes it all fit. For extreme period-correctness, there’s an in-car phone, a David Hasselhoff sticker and a Game Boy in the back seat. Also dig the paint, which is extremely lovely. You can see how much it makes the car stand out compared to the white-over-grey two-tone it had when bought. Nostalgia is coming off of this Jeep in physical waves. It rules.